So I am a big Topps fan. I am also a huge Royals fan. I collect all of the Royals Topps sets, I currently have every year from 1976 to 2011. I anxiously await what Royals will be released with each series Topps puts out. I am focusing on 2011 in this post. I just mentioned in another post that Series 2 Topps comes out in a couple short weeks on June 6, 2011. This led me to find a checklist and review what Royals cards I would soon be getting my hands on. The cards for the Royals on the 2011 series 2 checklist are as follows: Wilson Betemit, Billy Butler, Vin Mazzaro, Jason Kendall, Kila Ka’aihue, Joakim Soria, Luke Hochevar and Mitch Maier. The series 2 checklist is not final though, several should be added, see below for more details. So that is 17 Royals cards and just 7 that are legitimate forces on the team so far: horrible choices by Topps. Every year Topps releases a “Stadium Set” for teams to sell in their stadium gift shops. This year the set included a respectable 17 cards and here they are. Stadium Set: Billy Butler, Mike Aviles, Alcides Escobar, Chris Getz, Kyle Davies, Vin Mazzaro, Alex Gordon, Luke Hochevar, Kila Ka’aihue, Jason Kendall, Sean O’Sullivan, Joakim Soria, Wilson Betemit, Melky Cabrera, Jeremy Jeffress, Jeff Francoeur and a team card. Of these Escobar, Mazzaro, Cabrera, Jeffress and Francouer were all pictures of them on other teams but photoshopped to look like they were in Royals uniforms. These are better choices that the first two series’ of Topps. Alright now for more additions to the series 2 set. 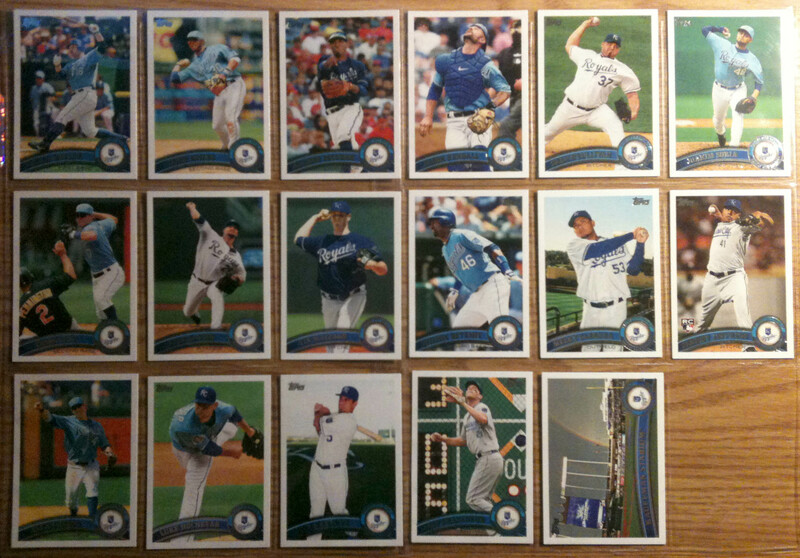 Last year the Royals series 2 set was 11 cards, the year prior to that 12. This is a good point to expect cards for 2011 except that the Royals have a ton of rookies and new additions so they might get a couple extras. They should really clean up in the Update set expected around September. 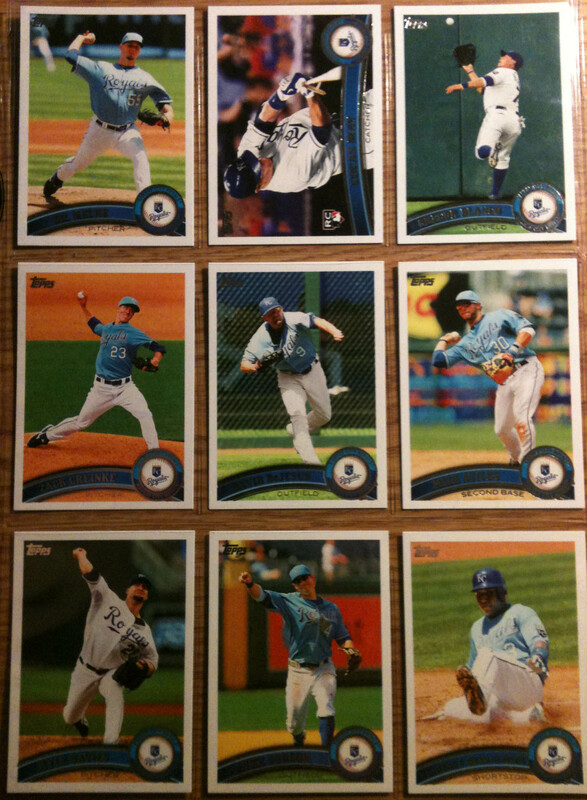 Escobar and Jeffress had Brewers cards in the 2011 Topps set so they won’t appear until the update set if even then. I don’t think Eric Hosmer was called up in time to have a card in series 2 this year so he will have a very sought after update card. Alright so we know 8 of the cards in the series 2 set but several numbers on the checklist are listed as “TBD.” Some of these will be Royals. Lets figure the Royals will get 13 cards in series 2. That leaves 4 more in the TBD category. Lets guess at these 4 cards. My guesses are Jeff Francoeur, Melky Cabrera, Bruce Chen, Aaron Crow Rookie and Jeff Francis. This is ignoring a couple big options, mainly Chris Getz, Matt Treanor, Tim Collins Rookie, Jarrod Dyson rookie and Brayan Pena. I wish I could get about 35 Royals cards this year but that probably won’t happen. I’ve rambled enough, any thoughts? I had planned to graph Blanco at the Omaha-Memphis game on Memorial Day. Got five cards. Guess I can scratch that one. Yeah, I don’t think the Royals really didn’t want him, it was more of a no room for him situation. It looks like Lorenzo Cain will be the next outfielder out of the organization to be called up. Plus, now even the speedster Dyson is competing for playing time at Omaha after he got sent down.